The Rime of the Modern Mariner is screening as a special event with a live performance of the musical score on Wednesday March 16 at 12:00pm at the Alamo Lamar C.
The Rime of the Modern Mariner (Director: Mark Donne): My father ran away to sea when he was 17 years old. For the next four years, he worked as a radio officer aboard a British merchant ship delivering freight all over North and South America and the Caribbean. It was in fact his numerous stops in Toronto that led him to bring his young family here in 1967. As he tells it, young men often chose the sea for the adventure and the freedom in those days. But things have changed dramatically since my father’s seafaring years. In this documentary, narrated by Carl Barat (guitarist for The Libertines), we are introduced to the modern face of merchant shipping. Larger ships filled with enormous and identical shipping containers, staffed by smaller and more culturally diverse crews, and owned by multinational companies have changed the mariner’s profession forever. But strangely, that story is only told in the second half of this rather frustrating film. For the first few minutes, Barat reads the overwritten narration at a breakneck pace, telling us about folkloric characters and tales from the London Docklands. There follow several interviews with former dockers and a short history of the decline of England’s (and the world’s) onetime maritime hub. No doubt dockers are worthy characters, but this was certainly not what I expected the film to be about. After more than half an hour, we finally get some lovely and quite mesmerizing footage of ships actually putting out to sea, and the music by Anthony Rossomando (The Klaxons) is a welcome respite from the narration, which begins to sound increasingly like Barat is reading someone else’s school essay aloud. The second half of the film introduces us to a few of the characters onboard a modern container ship, although we’re not provided with the men’s names or jobs. They talk about why they chose the sea, and about how the world of seafaring is changing, and it’s not for the better. Among those interviewed are a Filipino and an Indian, who seem content in their work. Contrast that with the white Britons who complain about “economic pressures” leading to the hiring of more “Far Eastern” crews. There is just a hint of racism in their lament that Britain, once the centre of the seafaring world, is now just a dwindling part of a globalized and very competitive industry. British maritime traditions are lost as crews are increasingly made up of a mixture of cultures, and you can sense the sadness and sometimes resentment in the older sailors and officers. There’s a small mention of modern piracy, but nobody seems terribly worried about it. Overall, the interviews are only marginally interesting, but they are easier to understand than the breathless narration. Sadly, Barat’s East London accent and his tendency to both mumble and rush end up hurting the film. I’m sure I missed some insights. That being said, I almost felt the narration would have worked better as a written essay, perhaps included in a booklet accompanying a film made up of more shots of the ships in motion and the sailors at work. 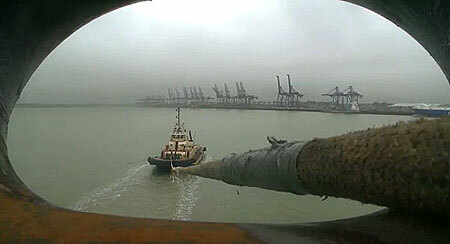 This entry was posted in Documentaries, Film Festivals, SXSW and tagged #sxsw11, dockworkers, seafaring, uk. Bookmark the permalink.